Antibacterial agents act against bacterial infection either by killing the bacterium or by arresting its growth. They do this by targeting bacterial DNA and its associated processes, attacking bacterial metabolic processes including protein synthesis, or interfering with bacterial cell wall synthesis and function. Antibacterial Agents is an essential guide to this important class of chemotherapeutic drugs. Compounds are organised according to their target, which helps the reader understand the mechanism of action of these drugs and how resistance can arise. The book uses an integrated “lab-to-clinic” approach which covers drug discovery, source or synthesis, mode of action, mechanisms of resistance, clinical aspects (including links to current guidelines, significant drug interactions, cautions and contraindications), prodrugs and future improvements. · Micro-organisms - Classification; DNA Replication; Metabolic Processes (Folic Acid Synthesis); Protein Synthesis; Bacterial Cell Wall Synthesis; Bacterial Detection and Identification; Other than its mode of action, what factors determine the antibacterial activity of a drug? ; The ‘Post-Antibiotic Age’? 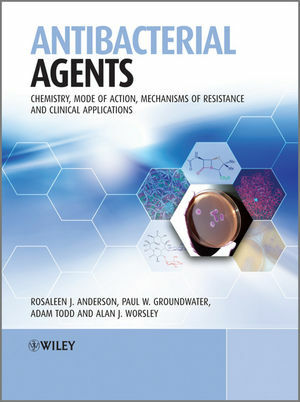 By categorizing and presenting antibacterial agents by target rather than by chemical class the book supports the thorough comprehension of the mechanism of action of these agents and also how resistance can arise. Integrated “lab-to-clinic” approach covers aspects from drug discovery and mechanism of action through to clinical applications. Incorporates results from the relevant Cochrane reviews.